A force transducer is a sensor that transforms the physical parameter – force, load, weight, into an equivalent analog electrical voltage signal that is proportional to the magnitude of the force. Force transducers are also called load cells. There are different types of load cells, each with its unique mode of operation and construction. The pneumatic and the hydraulic load cells are force balance devices that indicate the size of the force by the pressure it exerts on a transmitting medium like fluids or gases. Hence, they are not really transduction devices, except a pressure transducer is fixed to the pressure output thereby making the whole system bulky and expensive. The piezoelectric transducer uses the piezoelectric effect that makes a material generate electric charges when subjected to a stress. This device, however, can only support dynamic loading conditions; this is because the device works like a capacitor, but this capacitor has a large internal resistance, thereby causing rapid charge decay over a period of time. The most commonly used of force transducers is the strain gauge load cell, as it has a moderate combination of the good characteristics of the force balance devices and that of the piezoelectric transducer. Therefore, the thesis of this article is centered on its electrical connections. The major element working this transducer is the strain gauge which is a length of a flexible conductor – metallic or semiconductor, attached or micro-machined to a substrate which may be a polyester or any non-conducting layer. Together, the conductor and the substrate form a flexible material – the strain gauge that is then bonded to an elastic structural element – like a beam that makes up the force transducer. The bonded strain gauge is fixed such that its long length lies along the direction of application of the force to be measured. 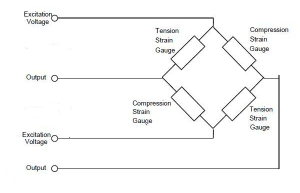 There are strain gauge designs that use multiple strain gauges with each attached to different parts of the structural element; the gauges could also be fabricated on a single substrate and then placed on a central location on the structure as shown in figure 1 below. In general, multi-gauge systems have improved sensitivity because the number of the strain gauge is directly proportional to sensitivity. Under the influence of a force applied to the loading point of the transducer, a stress is exerted on the elastic structural member that structure deflects; the structural member acts as a primary sensor. The deflection then creates a local strain along the length of its body. The strain gauge is bonded such that it lies around the region of maximum strain on the body of the structural member. The developed strain causes the strain gauge to deform in geometry hence causing variations in electrical resistance. It is the variation in the electrical resistance that is then measured and simply read out by a sensitive voltage meter or manipulated into variations in voltage that can be further processed to calculate the magnitude of the applied force. A Wheatstone bridge is the common approach to manipulating this changes in resistance. The Wheatstone bridge is more like a voltage divider that has four arms as shown in figure 2 below. Can you use a Single Load Cells to Measure Constant Weight? Figure 2. A Wheatstone bridge setup. 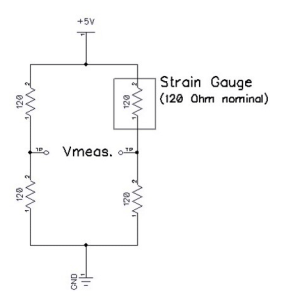 Consider a case: Measuring the changes in the resistance of a single strain gauge. The strain gauge is simply fixed into one arm of the Wheatstone bridge; hence it is no different from a resistor, in fact, it is a variable resistor. It should be noted that even though the strain gauge changes in resistance, it normally has a base resistance value; to make design easier, the resistors in the other arms of the bridge are made to have the same resistance as the strain gauge. This type of Wheatstone bridge configuration is called the Quarter-bridge configuration. 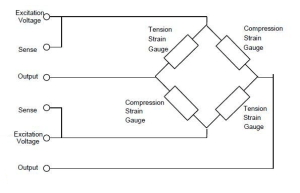 There are other configurations based on the number of strain gauges present in the arms of the bridge; multi-strain gauge electrical configurations are half-bridge configurations and full-bridge configurations. The half-bridge configuration consists of two strain gauges fixed into two alternating arms of the Wheatstone bridge. The strain gauges can be mounted on the structural element at high strain location to measure axial or bending strain. It gives a double sensitivity value. The full-bridge configuration has four strain gauges fixed into the four arms of the Wheatstone bridge. They are connected such that two strain gauges measuring the compressive strain are fixed on alternating arms while the remaining two strain gauges measuring the tensile strain are fixed into the other two arms of the bridge. The electrical resistance and the voltage output sensitivity of a strain gauge varies with temperature, hence, there is a high possibility of measurement errors. Therefore, the designs need to minimize the effects of these temperature changes on resistivity. Some designs make the strain gauges materials to be self-temperature compensating; some make use of dummy gauges – especially in the Quarter-bridge configuration; here the dummy gauge is placed in the arm alternate to the strain gauge. The other designs use a temperature compensated multi-strain gauge bridge configuration to cater to temperature shifts. Intuitively, looking at the underlying Wheatstone bridge connection of a strain gauge transducer, one would see that the minimum number of electrical wires coming off the device is four; that is by default, it is a four-wire system. In the four-wire system, there are two wires for power supply – positive and negative terminals, to the Wheatstone bridge; the other two wires are the signal output terminals of the bridge – the positive and negative output terminals. This wiring system is shown in figure 3. Now, most textbooks and articles always show the lumped parameter models of the strain gauge Wheatstone bridge and its connections. The lumped parameter model ideally assumes that the connecting wires to all these terminals on the Wheatstone bridge have zero resistance, hence zero voltage drop. The distributed parameter model is why there is a six-wire strain gauge system. The six-wire strain gauge load cell has the normal power supply/excitation and signals output terminal wires; in addition, there are the sense terminals – positive and negative terminals. The sense terminal wires are connected at one end to the nodes where the power supply wires are also connected as shown in figure 4 below. Figure 4. A 6-wire Circuit. It is set up so that the other end of these sense terminals are connected to the input port of an amplifier, the output of the amplifiers is then connected to the power supply terminals of the load cell – Wheatstone bridge. This way the actual voltage powering the load cell is detected and the amplifier makes the necessary adjustment to keep the voltage supply at the desired operating level irrespective of the voltage drop across the cables. So, there is a simple voltage controller design integrated with the six-wire system. This shows that a four-wire strain gage load cell is easily affected by the varying resistance of the supply wires; the six-wire type is not affected because it is possible to adjust the cable length without creating any error; the amplifier will make the needed gain adjustments to the power supply. In conclusion, an additional wire may be present in both types, this wire is called the shield wire. 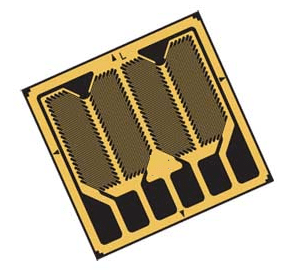 The shield wire is not hooked to the strain gauge rather it is connected to the body of the transducer. It protects the internal circuitry from electromagnetic interference. Full-Scale Output: this is the specification that determines the output voltage for a certain excitation voltage and applied load. It can also be called the sensitivity of the transducer. The unit is mV/V and common value of 2mV/V at rated capacity. The Zero Balance: this is the value that determines the transducer output voltage when no force is applied. The unit is also mV/V. Input Resistance: this is the resistance value obtained at the supply terminals of the force transducer at standard test condition, zero loads, zero excitation and with an open circuit output terminals. Output Resistance: the resistance value obtained at the signal output terminals under standard test conditions, zero load, zero excitation, and open circuit input terminals. Insulation Resistance: this is the resistance measured between the body of the transducer and the interconnecting node of all the device’s wires. A good transducer should have an insulation resistance that is greater or equal to Two Gigaohms. Temperature Effects: the temperature effects on the sensitivity and zero balance is a measure of how the output voltage changes with respect to temperature variations when the rated load and no-load is applied respectively. There is also the temperature range value which shows the range of temperature within which measurements must be taken to ensure accuracy. The various issues relating to the electrical connections of a strain gauge transducer have been shown in the body of this article. Although it was specifically for strain gauge load cells, the conceptual understanding can also be applied to other transducers like the pressure and piezoelectric transducers; for example, the compensating techniques for the influence of power supply cables. Furthermore, a force transducer always needs output signal amplification because the output electrical signal is always small – mV for strain gauge load cells and pC for piezoelectric transducers. Instrumentation amplifiers are used for strain gauge transducers while charge amplifiers are used for piezoelectric transducers. Other signal conditioning processes – such as noise filtering and isolation – are also carried for better accuracy. Finally, every transducer needs to be calibrated so that systematic errors eliminated for improved system accuracy.